Family Travel Network - Take a Marvelous Molokai Family Vacation. There is a Hawaii that still exists as in tales of old – unspoiled, lovely and mystically spiritual. This isle is built around nature and breathtaking beauty. It’s a place that’s not crammed with crowds, but filled instead with authentic Hawaiian culture and genuine Aloha spirit. It’s an island that holds fast to keeping its land, traditions, friendships and way of life untouched and well-preserved. This little piece of paradise is Molokai. Vacationers often come to Molokai for a day from Maui or one of the other islands, but to visit Molokai for such a short time is a mistake. Molokai is a stunning island that cannot be experienced in a day. There’s too much to do here and Molokai must be savored to be truly understood. Molokai is said to be the island where the hula was born and quite appropriately, the island itself tells a story. Listen, and don’t rush through it. Once it seeps into your soul, the gentle spirit of Molokai will never leave. Molokai is unique and must be approached in its own fashion: slowly, leisurely, and with an open heart. So, choose the road less traveled and bring your family to Molokai for your next vacation. You’ll be glad you did. 1. Take a Cultural Hike. An important part of visiting Molokai is learning about the island’s history and culture. One of the most meaningful and rewarding ways to do this is by taking the Halawa Valley Cultural Hike through one of the loveliest parts of Molokai. Anakala Pilipo Solatorio brings Molokai’s history to life through his fascinating stories and authentic cultural traditions that he shares with guests, such as Ho’okupu – the gift giving ceremony. His son and other family members lead the Halawa Valley Cultural Hike to 250-foot high Mo’oula Falls, approximately 1.7 miles each way. This hike is classified as intermediate/advanced and involves two river crossings, so it might be best for families with older children. Once at the falls, guests have the opportunity to take a swim in the pool underneath the waterfall - always a delicious treat after a long hike. 2. Talk Story with the Locals. Often called “The Friendly Island,” laid-back Molokai lives up to its name. The people of Molokai are one of the island’s greatest treasures. Spend some time strolling through the quaint little town of Kaunakakai and you’ll find out why. Stop in at the Molokai Visitors Bureau for insights and more information about what to do on your vacation. Walk down Kaunakakai’s Ala Malama Avenue and pop into Kalele Bookstore & Divine Expressions. This welcoming little store carries an excellent selection of books and gifts. Other great spots include Molokai Art from the Heart, Kanemitsu Bakery, Dave’s Hawaiian Ice Cream, Molokai Burger and Molokai Pizza Café. 3. Soak Up the Natural Beauty. Unspoiled and relatively undeveloped, Molokai has some of the most incredible vistas found in the Hawaiian Islands. This tranquil island isn’t overrun with throngs of tourists, so Molokai’s natural beauty can be fully enjoyed. Go kayaking or Stand Up Paddle Boarding inside Hawaii’s longest continuous fringing reef with Molokai Outdoor Activities. Spanning over 2,700 mountaintop acres, the Kamakou Preserve managed by the Nature Conservancy is another spectacular area for hiking. 4. Sun on a Deserted Beach. 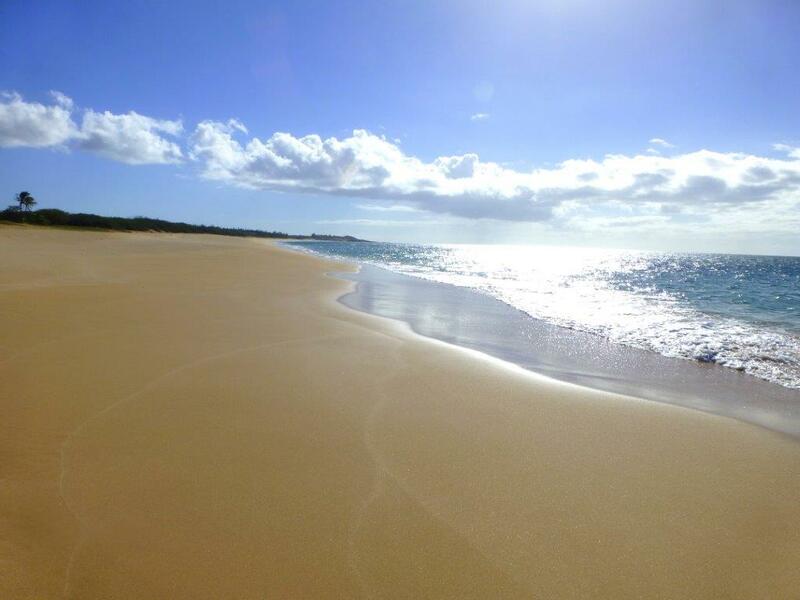 Molokai’s beaches are magnificent and generally uncrowded. It’s a dream come true to relax on these picture-perfect strands. Play and build sand castles on three-mile long Papohaku Beach and visit Kapukahehu Bay (Dixie Maru Beach), Sandy Beach and Kumimi Beach (also known as 20 Mile Beach), a popular spot for snorkeling. Ocean conditions and high surf can make swimming at a number of Molokai beaches a seasonal affair. Dixie Maru Beach can be an excellent choice for families in the summer and fall. Molokai’s extensive fringe barrier reef helps protect Sandy Beach and Kumimi Beach, so they are generally the best bets for year-round swimming and snorkeling. Always make sure to check daily conditions, no matter where you go. 5. Discover Local Island Treasures. There are lots of fun activities for families on Molokai. Take the kids to the Big Wind Kite Factory in Maunaloa to select a cool handmade kite, visit Purdy’s Natural Macadamia Nut Farm to sample some produce, and decorate free coconuts and mail them to friends and family via the Post-a-Nut service at Molokai’s Hoolehua Post Office. Families will also enjoy visiting the free outdoor market held on Saturdays along Ala Malama Avenue in Kaunakakai. Here you’ll find a variety of crafts made by local island artisans, colorful flowers, fresh fruits and vegetables, matted photographs and much more. You’re sure to uncover some great finds to take home with you. To make some treasures of your own, visit Molokai Plumerias. Your family can take a tour of this lovely plumeria orchard and even make your own fragrant leis. 6. Do the Legendary Mule Ride. Molokai has the highest sea cliffs in the world. As part of the Kalaupapa Mule Tour offered by Kalaupapa Rare Adventure, families with children 16 years of age and older have the opportunity to ride 1,700 feet down these sea cliffs to Kalaupapa National Historical Park. The steep Kalaupapa Trail, 3.2 miles from point to point, has 26 switchbacks and spectacular views. Traversing this serpentine trail is a real adventure, and it’s often the favorite part of many vacationers’ visits to Molokai. Legendary muleskinner Buzzy Sproat personally trains all of the mules and directs this activity. Spending time talking story with him is certainly part of the fun. Participants must be physically fit in order to take this journey. The Kalaupapa Mule Tour includes the two-way mule ride as well as a tour of Kalaupapa National Historical Park. Make reservations far in advance, as the company generally only allows 12 mules daily on the trail. On some occasions, a maximum of 18 mules may make the ride. 7. Experience the Kalaupapa Peninsula. Whether arriving in Kalaupapa by mule, via plane, or hiking on foot over three miles down the Pali Trail to the park, visiting Kalaupapa is a key reason to come to Molokai. Now a National Historical Park, Molokai’s Kalaupapa Peninsula was formerly a place of exile for those with Hansen’s disease – previously known as leprosy. Visiting Kalaupapa is an emotional and unforgettable experience. Surrounded by the world’s tallest sea cliffs, this hauntingly beautiful spot was once filled with heartache, grief and hope. Two saints, Father Damien and Mother Marianne, spent much of their lives ministering to those who lived here. Although a cure for Hansen’s disease has been available since the early 1940’s, some former patients still live here by choice. Only travelers who set up their visits with Damien Tours (808-567-6171) are allowed to have access to Kalaupapa National Historical Park, although Kalaupapa Rare Adventure can help with complete hiking and flight tour arrangements as well mule ride trips. No one under 16 years of age is permitted to visit Kalaupapa and no medical facilities for travelers are available here. For more information about Kalaupapa National Historic Park and arranging your visit, go to www.nps.gov/kala. 8. Make a Nightly Hot Bread Run. Located in Kaunakakai, Kanemitsu Bakery serves up mouthwateringly delicious breads and pastries. It’s also known for its night life, too. Drive over to the bakery zone at around 9 p.m. on any night except Monday and park your car. The Ala Malama Avenue storefront is closed, but thread your way along the dark alleys (or follow the locals) to the red door for a delicious treat – hot sweet Hawaiian bread loaves slathered with fillings like strawberry, blueberry, cream cheese, cinnamon, and butter. 9. Watch for Whales. From mid-December through April, thousands of massive humpback whales congregate in the channel between Molokai, Maui and Lanai to breed and give birth. Families have the chance to observe them on whale watching tours leaving from Molokai’s Kaunakakai Harbor, on the Molokai ferry, or even on land along Molokai’s south shore. This area is one of the best whale watching spots in the world, so don’t miss the opportunity to see these amazing creatures. 10. Learn About Hawaii’s Past. Parents want their children to learn while on vacation and Molokai offers numerous opportunities for enrichment. The island has a rich cultural heritage and significant agricultural history. Take a tour of the R.W. Meyer Sugar Mill and the Molokai Museum, both located next to each other. The sugar mill was built in 1877 and has been completely restored. Sugar was very important to the island and it’s fascinating to learn how it was harvested years ago. Also make sure to visit the many ancient fishponds used for aquaculture along Molokai’s southern coast. Molokai provides families with visually rich and memorable vacations, full of experiences that will last a lifetime. It’s the perfect place for families to slow down, strengthen family bonds, and relax. To experience a Molokai vacation through pictures, check out this Pinterest board. Hotel Molokai, featuring spacious rooms with Wi-Fi access, private lanais, and kitchenettes. The staff can arrange for tours and goes out of their way to provide outstanding service. If you’d like more room for your family to spread out,Molokai Vacation Properties offers the widest selection of oceanfront vacation homes and condominiums on the island. For more information on planning your visit to Molokai, go to the island’s website at www.gohawaii.com/molokai. ©Copyright 2014. The Beacon Group, Inc. All Rights Reserved.